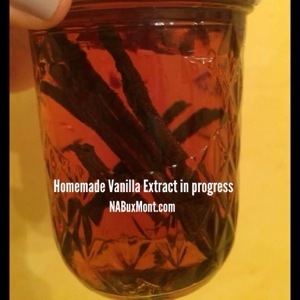 Making your own Vanilla Extract couldn’t be easier with this 2 ingredient DIY Homemade recipe. 1. Get a clean jar (that holds at least 8 ounces of liquid) with a tight lid. Mason jars work well. 2. Cut each vanilla bean in half lengthwise. 3. Scrape out the pods into the jar for a deeper flavor in less time. 4. Place the pods into the jar. Depending on the size of your bottle, chop the beans into smaller pieces. 5. Completely submerge with alcohol. Cover and shake. 6. Let it sit for at least one month in a cool, dark place, shaking a few times a week. 7. Taste after 1 month. If you like a stronger deeper flavor, let it infuse for another few weeks. 8. When it is to your taste, you may strain out the pods and seeds with a coffee filter, or leave it as is. *If you leave the pods in the jar, you can just top off the jar with more alcohol as you use the extract. You will need to add fresh beans or pods that you have used for other recipes. *For pods that have been completely extracted or are older, you can dry them and put them in your sugar or salt to make delicious vanilla sugar or vanilla salt for other recipes. This entry was posted in Dairy-free, Gluten-free, Local Recipes, Nut-free, Raw, RECIPES, Summer Flavors, Vegan, Vegetarian and tagged DIY, homemade, Vanilla Extract, Vanilla Salt, Vanilla Sugar by Healthy Living Bucks and Montgomery Counties. Bookmark the permalink.